PRC hosted its first Hard to Recycle collection event in Pittsburgh in the spring of 2003. This program has grown to include collections events at both ends of the Commonwealth which have collected over 2,500,000 lbs of electronics alone. PRC West will be hosting 6 collection events across Allegheny County in 2019. For more details Click Here or at the bottom of the page. In 2015 PRC East was forced to end its Hard to Recycle program as a direct result of the unintended consequences of Pennsylvania enacting the Covered Device Recycling Act in 2010. These events are based on PRC’s goal of providing a safe and responsible outlet for household products that are not commonly accepted in traditional recycling programs. While electronic scrap has been our focus, these events have expanded to accept a wide range of materials. In all cases, PRC will only include a material if we can find an outlet which meets the highest standards for environmental care. Our partners who recycle the collected electronics, eLoop and ECOvanta are Basel Action Network e-Stewards. 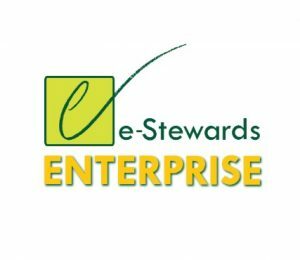 As certified e-stewards, they adhere to the highest industry standard for recycling responsibility which ensures no disposal in landfills or incinerators, no prison labor, nor any export of toxics to poor communities. PRC is committed to ensuring the materials we collect are recycled meeting the highest environmental and social standards. To show our commitment PRC has signed on as an e­Stewards® Enterprise. The designation recognizes cities, companies and nonprofits that take concrete measures to eliminate the export of hazardous electronic waste (e­waste) to developing countries by using Certified e­Stewards Recyclers to manage their electronic waste. For more information on estewards visit http://e-stewards.org/.